I've always had a soft spot for glogg. I have fond memories of guys who thought they could drink anything coming to our family celebrations on Christmas Eve and downing a couple of mugs of hot glogg and ending up as blithering idiots. My sister and I made some once using Aquavit, whole cardamoms, almonds, ...etc. One of the steps is to light it on fire and when we did we had a 3 foot flame in my kitchen! It was pretty good. Lately though I have been using the non-alcoholic stuff from IKEA and mixing it with pure grain alcohol so it has a punch. It works out well. The other day I found 3 different brands of glogg with liquor in it, at the liquor store and selected the one called Han's Andersonville. We'll see how good it is. imsscott wrote: Lately though I have been using the non-alcoholic stuff from IKEA and mixing it with pure grain alcohol so it has a punch. It works out well. Student A: What kind of drinks did you take to the party? Student B: Yoohoo and grain alcohol. Student A: Were you trying to get her drunk or to light her on fire? Seriously, does anyone actually drink grain alcohol? If so, what does it taste like? I'm guessing rocket fuel. On the other hand, imsscott, I am a big fan of glogg, when made with red wine. Josephine wrote: Seriously, does anyone actually drink grain alcohol? If so, what does it taste like? I'm guessing rocket fuel. We used to drink lit shots. It's a little harsh going down. In glogg it doesn't add any taste, it just makes it high in alchohol content. You can also use it for blowing fireballs out of your mouth. 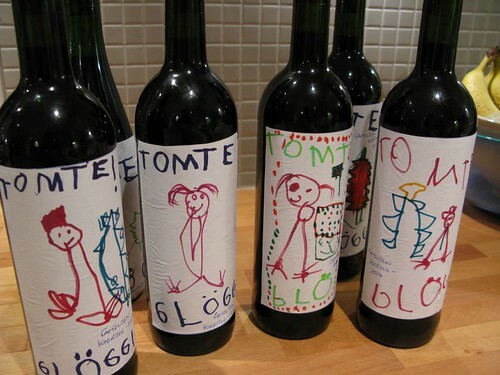 Josephine wrote: On the other hand, imsscott, I am a big fan of glogg, when made with red wine. Actually, real glogg is supposed to have both wine and Aquavit, a flavored vodka. Hmmm... As the site's self-proclaimed Swedish resident, I've just got to chime in here! "Glögg" in itself is a strange name (even in Swedish!) and comes from the time red wine first started showing up in Sweden. The quality was often poor so people began mixing spices and sugar in it to make it a little easier to swallow. Someone then discovered that burning the sugar gave the finished product a tastier, caramelized flavor. "Glögg" comes from the old Swedish "glödgat", or "burnt". This led to an elaborate procedure of dipping sugarcubes in alcohol, lighting them on fire and letting them drip into bowls of spice wine. All good things, however, come to an end and these days most glögg is bought pre-sweetened and served non-flaming. 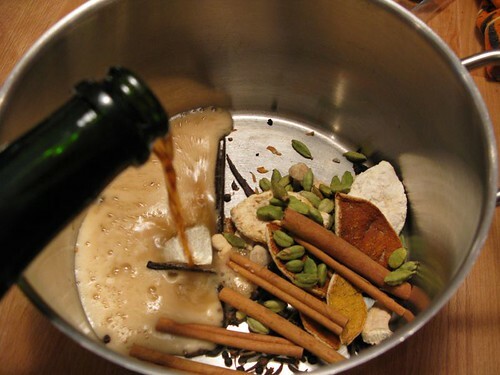 Most glögg is made from red wine (white wine versions do exist), sugar and spices (dried Sevilla orange peel, cloves, cinnamon, cardamom and dried ginger) and then perhaps spiked with some sort of alcohol. Brännvin/vodka may certainly be used but cognac or rum is even better. 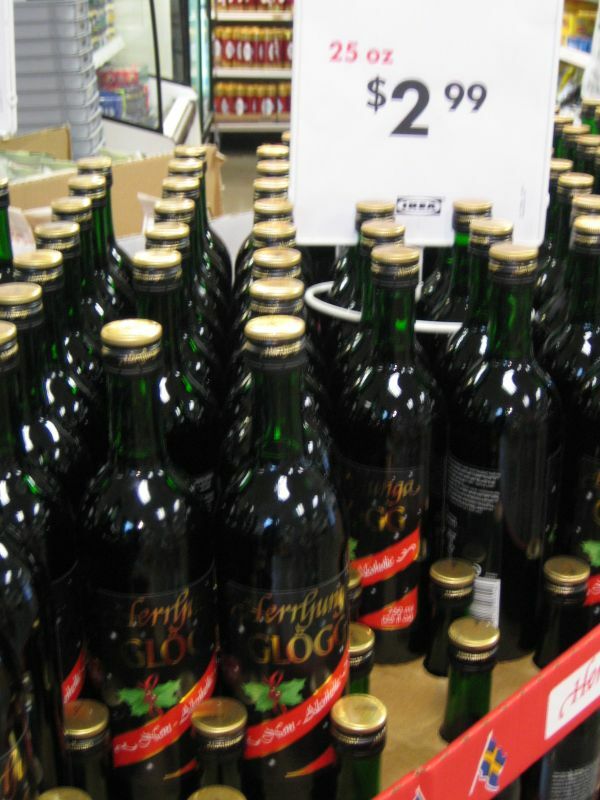 Here, one can buy commercially made glögg in a variety of alcoholic strengths - from completely alcohol-free (for kids) to 2.2% (for drivers), 10% ("wine" glögg), 15% ("fortified-wine glögg") and 21% (spiked). Actually, the market has exploded over the past 5 years and there are now over 50 types of glögg available at the State-run liquor store. There's premium glögg spiked with cognac, vanilla glögg, even chocolate glögg. Hi Bridgestone, thanks for the interesting post and your Swedish perspective, and thanks too to imsscott for starting this thread. In my Swedish-American family we would make glögg at Christmas time, especially if we were having a party, but we never tried to save any for future use. Here is the recipe that my mom uses and that I’ve made myself a few times. It’s a simple one and does not involve flaming liquid, sorry. * My mom’s instructions say “Squeeze raisins to get out all the wine.” But I dislike the added sediment in the glögg that results from this, so I don’t. ** The brandy is optional; the glögg is also great without being spiked. If your guests have anything they need to do after the glögg party (like, say, drive a car) you might consider leaving the brandy out. Thanks Bridgestone for the info and Amata for the recipe - I'll try it. *Dept. of quasi-related info: Low on options in that area - we decided, why not let's have lunch at Ikea - meatballs, salmon were quite good as was the lingonbery cheesecake. The steamed veggies were insipid. Generally, I was pleasantly surprised, though I suppose they subsidize the food thinking I'll buy the furniture (That didn't happen. Again). Amata, thanks for the recipe. My experience has been limited to the version available this time of year at Simon's Tavern, up in my neighborhood which, I gather, is fairly well-renowned. Your recipe sounds well worth the time to conjure up a batch: one needs something to accompany the relatively imminent opening on Chanukah presents, doesn't one? One question: does a smashed cinnamon stick qualify as "bark"? Thanks! I'm glad you (and sazerac) might try the recipe. Yes, a cinnamon stick, broken up, is what you want. By the way, (I'll risk stating the obvious here) this is a recipe where you want to use something generic for both the red wine and the brandy components. Anything nice will be wasted once combined with the spices, raisins, and sugar. have you tried Glunz Family's Glogg? It's made locally... they sell it in bottles at various wine shops around the city. or you could go to the House of Glunz itself (at wells and Division)... it's the oldest wine shop in the city (maybe the country?) ... went to a really great tasting there once. Amata wrote: By the way, (I'll risk stating the obvious here) this is a recipe where you want to use something generic for both the red wine and the brandy components. Anything nice will be wasted once combined with the spices, raisins, and sugar. True, but you don't want some (very) cheap swill either. I've made spiced/mulled wine - generally with a syrah or cabernet - usually adding some lemon and/or orange zest, cinnamon, cloves and a little sugar and drunk warm. I never thought to fortify the wine though, or put raisins. This Christmas, one of the things people are sure to miss most about Hans Gotling is his famous glogg, the warm traditional Swedish drink he made of port wine, cinnamon, cloves and other ingredients. Mr. Gotling, 77, died Monday, Dec. 4, at Resurrection Medical Center in Chicago, said his wife, Carol Gotling. Mr. Gotling, a bar owner of 30 years and a fixture in the Andersonville community, created his own brand of the drink, Mr. Hans' Andersonville Glogg. Friends and family say that among his happiest times were selling his bottled glogg to customers, some who drove from as far as Minnesota for his homemade recipe. Mr. Gotling opened his bar, Clark Fosters Liquor, in the mid-1950s and kept it open for more than 30 years, drawing neighborhood crowds and various elements of the Chicago political machine, according to family and friends. "Hans knew everybody in the neighborhood," said Mike Roper, who bought the establishment from Mr. Gotling in the early '90s and renamed it Hopleaf Bar. "His bar was a big deal. It was from an era when all the tavern owners lived above their stores, and bars had multi-generation family owners." "It was the way neighborhood bars used to be," she said. "Never any trouble, just one big, happy family," she said. Mr. Gotling arrived in the United States as a teenager from Sweden in 1946, landing in New York en route to Chicago, where an aunt and uncle lived. "He originally came here thinking he would only come for a year, but he loved America, he loved the U.S., and he loved the opportunities that were afforded people here," Carol Gotling said. He loved it so much, in fact, it was about "six years until he made it back to his native Sweden," she said. Those who knew him remember his humorous stories, positive attitude and persistence. Family members recalled his stories about his first two weeks in the U.S.
"He ate nothing but eggs and ham the whole time he was in New York, because those were the only words he knew how to say in English," said his son Glenn. His tavern also catered to the local Swedish population, serving its beloved holiday drink. For a long time, Mr. Gotling made his Christmas concoction in his apartment and sold it in his bar, Roper said. His wife remembers when he decided to sell it commercially. "It was so popular, and so many people came there for it, he eventually decided to go commercial with it." Mr. Gotling linked up with a Midwest distributor. Eventually, he sold the brand and recipe to a company in Minnesota, his wife said. "The thing is that his boys and I always talk about is that there are people who simply live life and those who experience it--he definitely experienced it," Carol Gotling said. I know I probably quoted more than I should have. However it is an obituary to be proud of. The Sun Times published Hans Gotling's glogg recipe last year. I made a batch and thoroughly enjoyed it. If this link doesn't work, you can find it by goes to the archives section of the SunTimes website and searching for glogg. Bridgestone wrote: Hmmm... As the site's self-proclaimed Swedish resident, I've just got to chime in here! Interesting. I am not familiar with the Swedish aquavit, having never found any when I was making glögg. We just used either the Danish or Norwegian aquavit which is flavored and approximately 80 proof. Since all the seasonings and wine overpower the flavor in the aquavit, it is kind of a waste to use it. It's even a waste to use good vodka, since it doesn't provide any flavor and is just used for the alcohol. That's why we have gone to grain alcohol, since it provides punch without the taste, and not much is needed, which is especially important when adding to the non-alcoholic glögg mixes, so that it doesn't get watered down. Brandy does sound like a good idea though to add flavor and kick. The non-alcohol version is an easy way to go and it lets children and non-drinkers enjoy it too. 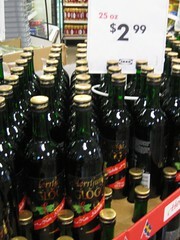 imsscott wrote: Actually, real glogg is supposed to have both wine and Aquavit, a flavored vodka. Thanks all for their posts on this most interesting thread. Go for the port, Gypsy Boy, if you can find it for a good price. But, cut down on the sugar and/or additional alcohol you may be adding otherwise. The end product should be full of spice, (warm), a little sweet and with a little kick. How you get to that combination is perhaps of lesser importance. Everyone over here (that actually bothers to make their own these days) has their own recipe so you'd probably find hundreds of combinations of wine, port and/or spirits around. But I think that port is a great idea! Bring the water, sugar and spices to a boil. Remove from heat and let stand overnight. Add wine and vodka, warm and serve with raisins and peeled almonds. I haven't tried this recipe but I think it's safe to say that it should pack a decent punch. Christmas is sneaking up on me at least but I finally got this year's batch of glögg made. The beer is perhaps a little unorthodox but I wanted a little extra maltiness in the glögg. 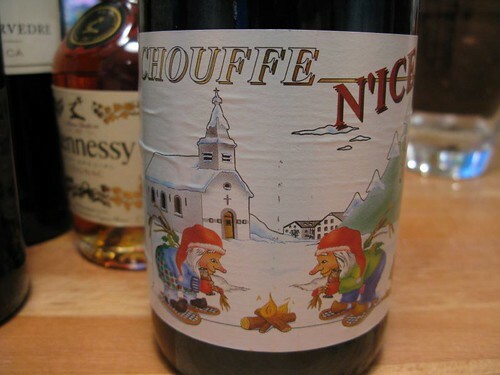 This year's flavors in N'ice Chouffe were thyme and Curacao. 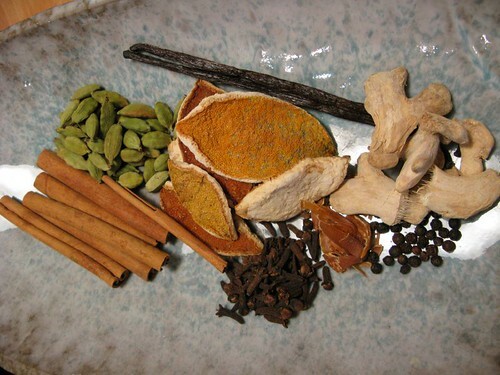 That's cinnamon, cardamom pods, dried seville orange peel, vanilla pods, cloves, mace, dried ginger and black peppar. Start by adding the beer to the spices and bring to a boil. Anyway, boil the beer with the spices for awhile and mix with the wine, a cup or two of cognac (just let your wallet regulate the amounts), and a half bottle of vodka. Let the entire mixture steep for a week or so. Before bottling, I made a simple sugar mixture from equal amounts of brown and refined sugar and as little water as possible. Carefully sweeten the glögg. Glögg should be pretty sweet as you need a fair amount of sugar to cut through the booze and the spices. However, too much sugar makes for a very cloying tipple. I used about one quart of sugar for my 7-ish bottles of booze. While I have yet to receive any peer reviews, I think that this year's batch turned out quite well. It's got a hearty kick but the malt of the beer is somewhere in there. Spice-wise, I like a the fact that this has a little extra cinnamon and the gentle heat of a little black peppar.